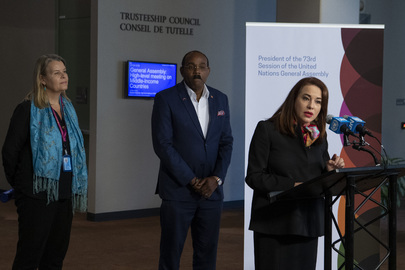 María Fernanda Espinosa Garcés (at podium), President of the seventy-third session of the General Assembly, briefs press on the launch of the Global Campaign against Plastic Pollution and single-use of plastic. Behind her are Mari Skåre (left), Deputy Permanent Representative of Norway, and Gaston Browne, Prime Minister of Antigua and Barbuda. The campaign focuses on reducing single-use plastic within the UN as well as a global advocacy campaign against single-use plastic more generally.